Fallout is a stunning book, in the way that it shows that drugs don't just effect the user. It show the damage that can come to their families in the future. Hunter's voice was strong and while he lived with Kristina's parents, he still felt out of place and like he was abandoned. Hunter had his issues with his on and off girlfriend, because of this. Autumn lives with her grandfather and aunt. She also met the first boy that has paid attention with her. That is until her dad comes in and she learns about the family that she never knew about. Summer goes from foster home to foster home with the occasional stop at her dad's house. Her family doesn't seem real anymore. Hopkins weaves all three of these stories in ease. She shows that all of Kristina's children have had their problems in the past and present. All of the tension build up to a stunning ending that keeps you wanting more, while resolving what happened. I enjoyed the fact that there were news paper clippings through out the book. 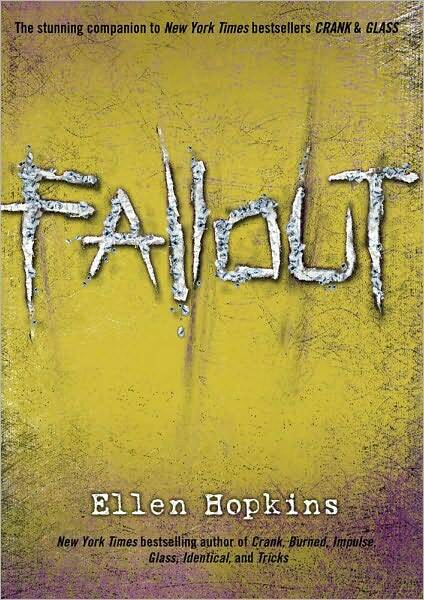 Fallout was an original book, because you usually don't get to see what happens after someone continually does drugs. Hopkins is a stunning writer. Her books are gritty, fierce, and honest that will keep you wanting more. I highly recommend this book to fans of Courtney Summers, Julie Ann Peters, and Ellen Hopkins' previous books. Thanks so much, Sarah! Appreciate you reading and the great review. Fallout is the third book in a fabulous series and couldn't have been better written! Ellen Hopkins takes the stories of three children whose lives are so different and makes you feel like you are a part of them. I love how Fallout finally ties everything and everyone together.